Keep in mind, the picture of Mikotoba and Souseki was taken before they went to the beach. That means we have two options here. 1) The crack in the camera was indeed caused by Jezail fighting back. That means Jezail was killed before they went to the beach and the person who came in to loudly exclaim "I WANT EVERYONE HERE TO JOIN ME AT THE BEACH" was someone (the photographer?) in disguise. Now, considering the fact that Jezail always wears a mask, I'm willing to bank that it was the former option and that the actual crime scene was somewhere else. The university, perhaps? After luring everyone to the beach and finding a way to drop the body in the tent without alerting Haori, everyone could've played out just as Souseki and Hosonaga had seen it. Haori was supposed to be Jezail's assistant in the beach. How would she NOT notice that Jezail was dead by then? That's what I'm trying to figure out... There must've been a switcheroo somehow. A point where the disguised Jezail disappeared and was replaced by the corpse. Just how closely was Haori watching Jezail? That's a blank the demo never filled in, because as usual, we weren't given the defendant's story. Keep in mind here, it's very odd for Jezail to walk into a room and invite a couple of strangers to go to the beach with her. The only explanation I can give would be that this invitation was meant to gather some convenient witnesses in one place for a frame job. This, in turn, implies that the person who extended the invitation was the murderer, not the victim. Last edited by Meowzy on Sat Apr 29, 2017 9:37 am, edited 2 times in total. The photo of Jezail at the scene doesn't have any sort of crack in it, and there's nothing to indicate we're supposed to be seeing it as a photo taken by the journalist rather than the police. The crack is in the photo of Yuujin and Souseki debating before the group went to the beach. However, that doesn't mean the camera wasn't damaged at the beach. Given the game is set in 1900, the camera was almost certainly using glass plates, not film. If the journalist left the plate of Yuujin and Souseki in his camera, then if his camera was damaged later (say, during a struggle with Jezail), then the plate - and by extension the picture - could have been cracked. Or if the plate was in his bag and his bag got tossed around, etc. Some sort of disguise/switcheroo is still possible, granted. I have no idea how the photographer would have killed Jezail in the beach house with nobody noticing, just that I'm pretty sure he did. I didn't know about the glass plates thing, though. I guess it means that the camera could've still been damaged after the meeting between Mikotoba and Souseki? I mean,with how long the first case of DGS1 dragged out with more and more evidence coming from nowhere I-5 style,you could say that there'll be more revealed with stuff like that with the end of the case. Let's hope the journalist guy doesn't need drag out as much though. 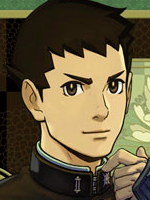 Calling it now: I know the killer of DGS2-1. So let's recall: the only reason everyone went to the beach was that Souseki and Yuujin had a chat at the university for posterity, and Jezail showed up and invited everyone to the beach. Murasame, Souseki, and Hosonaga accompanied her. -We get a newspaper article (with photo) of Yuujin and Souseki's chat. Yuujin mentions that it wasn't their idea, it was the newspaper's. -The photo doesn't appear to have anything that could be a clue - but very conspicuously, the image is cracked, as though the camera plates were damaged. -Jezail was holding an ink pen when she was killed. -Jezail's autopsy report mentions her pupils were very constricted at the time of death, but it wasn't poison. Conclusion: the journalist isn't just an animation gag - he's a real character, and he did it. He doesn't really care about Souseki, but he promo'd Souseki and set up the meeting with Yuujin to get close to Jezail. At the beach, he blinded her with the flash of his camera (the hut was very dark - you would expect her pupils to be dilated, not constricted) and killed her. Wow, that's a really good theory! 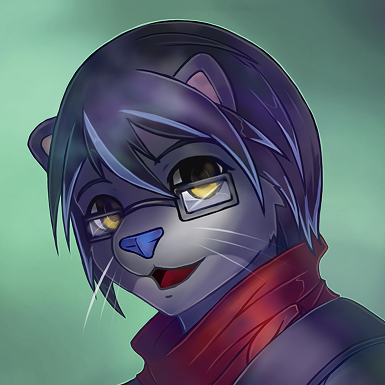 I didn't even think the pupil dilation could be due to a sudden exposure to really bright light in a dark environment...like, say, a camera flash! And it took me reading that theory to realize the weird streak on Mikotoba and Souseki's picture was a photo crack. I thought it was some sort of stray indoor tree branch or something. Regardless of whether or not the journalist is the murderer (though he seems the most likely guy right now unless the case throws us a fourth witness), it seems that he'll be a person of some importance, considering the Famitsu screenshots show he'll take the stand later on. Edit: Nevermind, I missed the entire third page of discussions. So basically all the unresolved plot points from the first game? I'm hoping that's a given at this point. > The relevance of the Hound of the Baskervilles story and how Susato knows about it. > Why was Watson murdered at all? What was he investigating that was so important and complicated, it kept him away from home for ten years while Iris was growing up? It's not a plothole, it's very clear that the characters also find it strange how she knows about it, it's definitely a mystery that will be solved. So apparently a behind-the-scenes video was shown at the end of the most recent AA concert, involving motion-capture and tapdancing. Soooo... Which character will be tapdancing, if at all? Really? Is there a link to that? I haven't been able to find one yet, sadly. The fact that it happened is up on a Japanese Twitter and was retweeted by Court Records. Oh, I see. It's probably Sherlock, though. Here's the tapdancing video, just uploaded by Capcom to Youtube! No gameplay footage, mostly recording for the trailer theme, but there's some motion capture stuff in there. My speculation that the person tap dancing is actually portraying Sherlock still stands, since the theme in the video sounds rather similar to a Joint Reasoning one. Maybe it's the JR theme for the game. Viridian is the killer of William, and of case 2. She's also somehow connected to both of them, and was probably going to visit him with some books and/or to kill him, but was accidentally stabbed in the process by the Garridebs. She killed Case 2? NOOOOOOO!!! Souseki saw the victim alive that morning (or the evening before or something? Shortly after the not-guilty verdict, anyway), then Naruhodou and co. go to meet Viridian in the hospital, as she'd only just regained consciousness. The only thing I could theorize in terms of her being the killer is that she visited the boarding house, left poison there, was accidentally stabbed by Mrs. Garrideb on the way out and several days later (after the trial) Petenshy finally ingested the poison and died. It's possible they're using the chronology of the cases specifically to confuse us. Apollo Justice pulled a similar move with the poison being ingested a long time after it was initially planted. It wasn't confirmed Petenshy was actually poisoned though, so I don't know about all this. Meterman seems WAY too obvious to be the killer, so unless there's a third character not yet introduced, I'll stick to Green for now. Related to DGS2 speculation, I'm going through the first game and noticed something odd about the end of the first case. That is, the judge. At the very end of the trial, the judge spurs Asougi on about his "mission" and Asougi, in turn, makes a 'scary face'. He seriously looks away with a very conflicted expression. So now I'm left wondering... Why does the judge know about this mission? Is he supposed to know about this? Because I get the impression from Asougi's reaction that it being brought up caught him off-guard. Aside from that, Jezail requests a private talk with the Judge and not long after, it's confirmed to Naruhodou and co. that she can't be judged for her crimes in Japan because of some loophole agreement. Naruhodou and co. find it very odd that this agreement would apply to a mere student, because it's usually applied to something of a strong political nature. So what is it that Jezail told the judge that would set this agreement into motion? Something about this sequence of events all strikes me as very suspicious. The thing is, though, that the judge was constantly on Naruhodou's side during the trial and thus wouldn't be on the same side as Jezail, so I'm not sure what to make of all this. I would think it to be simple. She informed him of what would happen if he didn't agree. That is, the trust that Britain and Japan had built would be destroyed. As for Asougi's mission, you've got a point there. Maybe he was in on it, just like Hosonoga? Your guess is as good as mine. they'd been emphasizing throughout the entire trial that the relationship between Japan and England was delicate and they'd have to tread carefully, but it hadn't stopped the judge one bit. He kept insisting Jezail should stay whenever she was asked to be dismissed. Why would it impact him after the trial was over? And just as Naruhodou and co theorize, it's odd that the agreement is used in Jezail's case because she's 'just a student'. Did she tell the judge some important secret that changed his attitude towards her, or was the decision made by someone on a higher level than the judge? If it's the latter, what was the point of Jezail asking for a private talk to begin with? You raise a good point. I'm not even sure if we'll find that part out though, honestly. 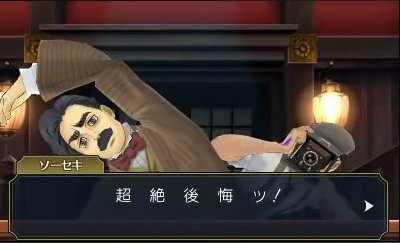 And I doubt that character is going to be the killer in DGS2-1. Then how do you explain his card an all? He looked obviously unnerved submitting that. People can have part-time jobs. Say he's an assassin who infiltrated the police force and worked his way up the ranks. The police force sent him to infiltrate La Quantos (or maybe he volunteered to do it?) and Jezail, perhaps knowing he would be there, chose that place to off Watson with the Curare. Now, still being a legitimate undercover detective, of course the thought of handing over his business card in court to reveal that he's a detective would give him pause. Also bear in mind, he's the one who told the other two witnesses to pretend they hadn't seen Jezail with a claim of being ordered to by his bosses. Either that, or there's a greater mastermind ploy happening where he purposely drew a useless map on the back of his business card and brought it up in court, knowing that the judge would demand to have it as evidence. Being unmasked as a detective rather than a waiter allowed him to give far more specific testimony in court or... whatever. Even if my theory is true, it's incredibly hard to say whether he doesn't turn on Jezail halfway into their testimony, because at some points he seems to be helping her prove her point (and even mimicking her suspicious motions like headtilts with innocent smiles), but at other points he's thwarting her. A good example is when she insults the police force and their investigation, and then he reveals that he confiscated the poison bottle. ...After which he obediently pours her a glass of the water, knowing damn well that Naruhodou claimed there could be lethal poison it and thus he would be killing the woman standing next to him. Unless, of course, he already knew that the curare wouldn't affect her without any open wounds. Naruhodou: "Hosonaga-san, you are a detective, right?" Hosonaga: "Now now, let's not talk about things of the past!" DGS2 basically confirms that he must've been enlisted with the cops for real, or he wouldn't have been assigned to watch over Jezail. He could get away with pretending to watch over Asougi on the steamship, but definitely not Jezail on the beach. Still, the fact that they allowed the same idiot- who was basically helping her frame some innocent student for her own murder- to watch over her during her last day in Japan just... I don't know. I just don't know. Something is up here and I can't quite tell what it is. The De Killer vibe he's got on him sure keeps on persisting, and it wouldn't be the first time a De Killer turned against his own client. Hmm, you have a point. The first de Killer did appear in the early 1900s, which lines up a bit with the time of DGS2 (since the Meiji era only ends in 1912. Maybe it could be A. Sasha- the pun maybe is Assassin? The timeline adding up is definitely part of the reason I'm still clinging to this theory, but... There's also his mannerisms, his speech, his lazy/bad disguises, his character design... Everything about Hosonaga just screams 'DE KILLER'. Which of course could be a red herring meant to draw attention away from the actual first De Killer, if indeed we're even getting one in the DGS series. postponing the killer's trial due to those same legal loopholes. Jezail was let off, so what about the person who was probably assigned to kill her? To keep things under wraps, that person's identity (I'm still betting on the journalist with Souseki) would have to be covered up by the courts. In any case, Hurt/Hart Vortex would definitely know something about this conspiracy. One doesn't have a pun name like that and not be involved! The journalist appears to be Japanese. I mean, it'd be a bit odd for an English person to be working for a Japanese newspaper as a simple photographer. Because of that, they can't make use of the same loophole to postpone this guy's trial. There might be other loopholes at play, but I would think that because this most-likely-Japanese person killed an English woman, if anything his trial would be sped along as a show of good will towards England. If it turns out he is English, then yeah, so long speedy conviction. Okay, Case 3 info is out, and...I'm quite puzzled as to what the solution could be. An electricity-based teleporter malfunctions and explodes in the middle of a public demonstration in the World Fair. Both the body and the teleporter are somehow moved from a public outside area to the inside of the Crystal Tower. The teleporter is about as big as a park gazebo. How'd it happen? Last edited by CourtroomShenanigans on Wed Jun 14, 2017 5:00 pm, edited 2 times in total. I mean, there's that boy in a hot air balloon during the event. I think he has to be involved with it somehow. As for the killer, I think it's the guy with the robot hand. Super suspicious. I'm not sure if you could take that by air without someone noticing...unless it had been modified beforehand that it can somehow blend itself with other hot-air balloons. Or, alternatively, the thing can be broken down piece by piece and assembled afterwards...though that depends on the time between Dovinbow flipping the switch and the body being discovered in the Crystal Tower. On a more serious, perhaps more game-spanning note, the cover art shows a lot of interesting people. Haori, Gregson, and Souseki are prominently in the cover art, along with a guy with a bowler hat. Said guy doesn't look like Watson - his hair's the wrong color, the hat's different; Dr. Watson's on the back along with what may be a young Barok, a sharp-faced man with a mustache, and a silver-haired lady. Said lady has what appears to be a caduceus on her tie...doctor, perhaps? Also, said sharp-faced man appears to have slicked back hair spikes. Behind the silver-haired lady appears to be a man with a plague-doctor mask...a surgeon? Or a butcher, perhaps? And of course, the masked man with a sword parallel to Barok. The game's Big Bad? Or perhaps a red herring of sorts? Also, why is Gregson's back facing us? And why is the Imperial Court Judge with the above four people in the back? So many questions. That'll be pretty ironic. Both of those people in white coats may actually be doctors. The one facing front has a badge on her lapel. It seems to be the caduceus symbol on her tie (the one with two twirling snakes). Then again, all these new characters look suspicious, and even some familiar faces (the Jap judge esp.) are even more so.